The video was not working on April 6th, but it showed up finally on YouTube. Sunday night’s episode of The Simpsons, “Caper Chase,” ridiculed the “highly-entitled wusses” that attend America’s universities. 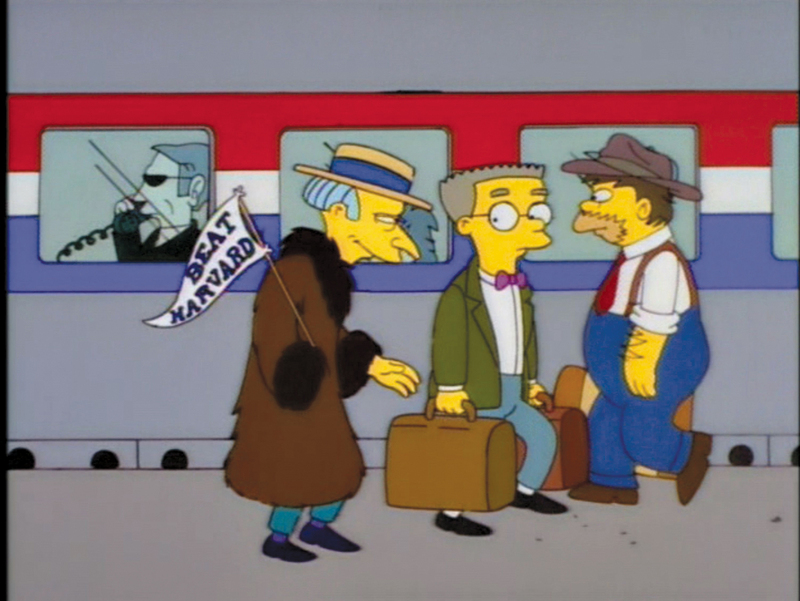 When Mr. Burns tries to endow a Department of Nuclear Plant Management at his alma mater, Yale University, he comes face to face with the horror that is today’s college campus: easily offended, politically correct students overdosed with a hatred for micro-aggressions and cultural appropriation with a need for safe spaces. Mr. Burns- I’d like to endow a Department of Nuclear Plant Management. Male Yale Representative- Wonderful. Of course we can’t do nuclear. Female Yale Representative – Our students are highly-entitled wusses. Male Yale Representative – You’d be creating a space for violence to happen. How about funding a chair in the non-narrative cinema of self-identified pan-sexuals? Mr. Burns- What? What? What? What? What?! Female Yale Representative – We also need to hire more deans to decide which Halloween costumes are appropriate. Male Yale Representative – Eight deans should do it. Mr. Burns- (Sputters) Is this still a coven of capitalism where evil money can acquire a patina of virtue? Male Yale Representative – Yes, that’s in our charter. Female Yale Representative – But with an issue as hetero-patriarchal as nuclear power, we’ll have to hire multicultural empathizers, build a new safe space. College Student- Not so fast. We insist on a chair of anti-nuclear studies and a nuclear-neutral curriculum pathway. Male Yale Representative – Absolutely, Teddy. We run all decisions past the squash team. College Student- Also the fencing team, water polo and Handsome Dan the mascot. Mr. Burns- Release me, you hound. Mascot- (Goofy laughter) Oh, yeah. Mr. Burns- What’s happened to this place? (Gasps) (Gasps) This was the home of ruthless media disruptor Samuel F.B. Morse. Who’s his successor? That fellow? College Student- “Fellow”? That word is cis-gender-normative, okay? You’re worse than Hitler! Mr. Burns- Too late for flattery. I’m not giving this school a dime. 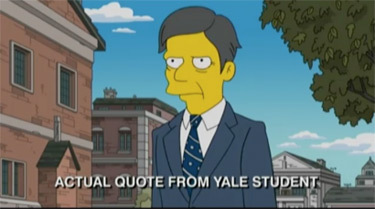 The Simpsons was explicit in its parody of Yale students, even using an exact quote from a student. Later in the episode, Homer must disrupt a man’s scheme to place robot-students in colleges in order to receive tax-payer funded student loans. Upon leaving a gender-neutral bathroom, Homer comes up with a plan to sabotage the robots by offending them. This video wasn’t loading successfully this morning, but I’ll leave it here for now, hoping that they’ll fix the link. Hat tip to classmate Seattle Sam. 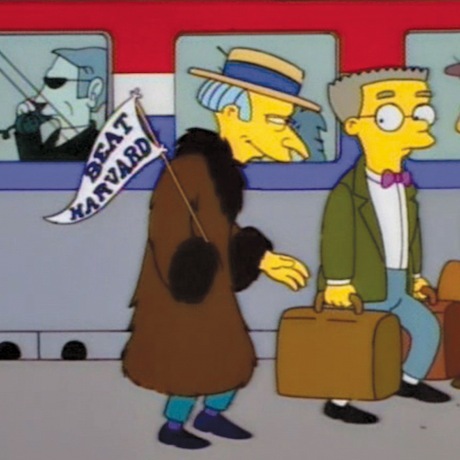 Burns: Honestly, Smithers, I don’t know why Harvard even bothers to show up. They barely even won. 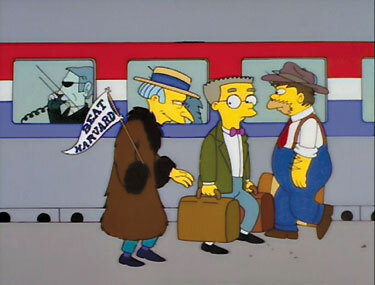 Smithers: Their cheating was even more rampant than last year, sir. Hat tip to the Yale Alumni Magazine. 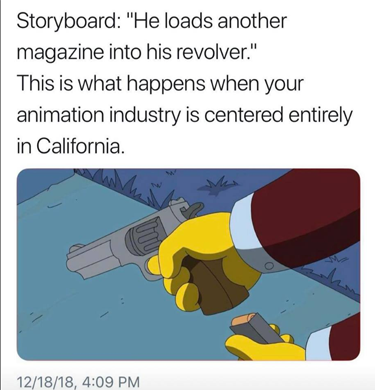 the Archives of Never Yet Melted in the 'The Simpsons' Category.